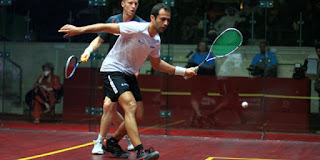 Today I'm going to talk about furniture, a clock and Amr Shabana. I know strange combo, right? 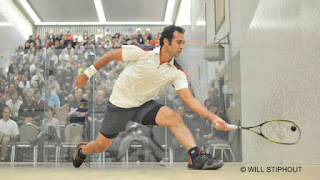 Well I'm going to use pictures of Shabana to demonstrate how to vary your swing path for different types of drop shots. The furniture and clock parts are things that I like to use for visualizing the swing paths of various drop shots. As you learn to do this your swing path will stay on line and your drops will become more consistent; perhaps even resembling the great Maestro! The height you receive the ball is the main determining factor for your swing path. The distance off the sidewall and pace of the ball are all factors as well, but today I will only get into the receiving height and how this influences your swing path. Let's get right into and use some examples for you. 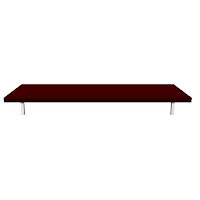 Below we have a low coffee table. I like to use this as an image when explaining how to hit drops that are hit just above the tin. You are hitting the ball at a height that is already at the target you want to hit on the front wall, so you simply swing right across the low coffee table. I find many people drop their follow through or start with their racquet to high for this shot. The length of the swing can greatly vary even at the highest level. We can also look at this picture of Shabana and visualize how his swing would have been right along the above low coffee table. Basically the height of the ball is just about where he is aiming on the front wall so we will be swinging parallel to the floor and following through on this same line. Considering I don't see his opponent in sight, I think it's safe to assume he won this point! Shabana swinging across the low coffee table with a relatively flat racquet face on this forehand drop. If you are going to hit a drop from higher on the bounce or the volley you want to aim down, meaning you will have to swing high to low. The amount you swing from high to low depends on the angle you have. The higher the ball is at contact the more severely you can cut down on the ball. You can either lift the back part of the coffee table, or think of a the hands on a clock as an example. For example if using the clock, you can swing from 2:00 to 8:00. In the example below you would swing from approximately 2:00 (high) to 8:00 (low). Shabana about to slot this into the nick swinging from high (2:00) to low (8:00) with an open racquet face. Also important to note here is the angle of the racquet face. If your racquet face is closed and your swing path is from high to low you have a good chance of hitting the ball into the floor or the tin, or at least hitting the ball too hard. So having an open racquet is an important characteristic of a drop when making contact from higher than your target on the front wall. I don't want to get too complex here, but very skilled players will actually swing from high to low (like the clock above) and will finish up again, close to the height they initiated their swing from. This means their swing path is high to low, straightening up through contact and then back to high again. This allows them to put a lot of slice on the ball and also keep the ball above the tin as the follow through has a major influence over the direction of the shot. 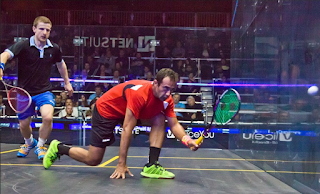 If we look at a drop which is struck from under the height of the tin it is easy to visualize how we need to start our swing low (under the ball) and finish higher then we started (see another great example of Shabana doing this below). You can tell Shabana had struck the ball below the height of the tin and because of this the ball is rising on the way to the front wall. This is how he can get the ball over the tin. The problem with this is that we are hitting up on the ball and that once the ball hits the front wall it is almost surely to still be rising slightly. If you also include that the swing preparation for hitting a drop lacks deception, you can tell why it isn't hit very often from below the height of the tin. 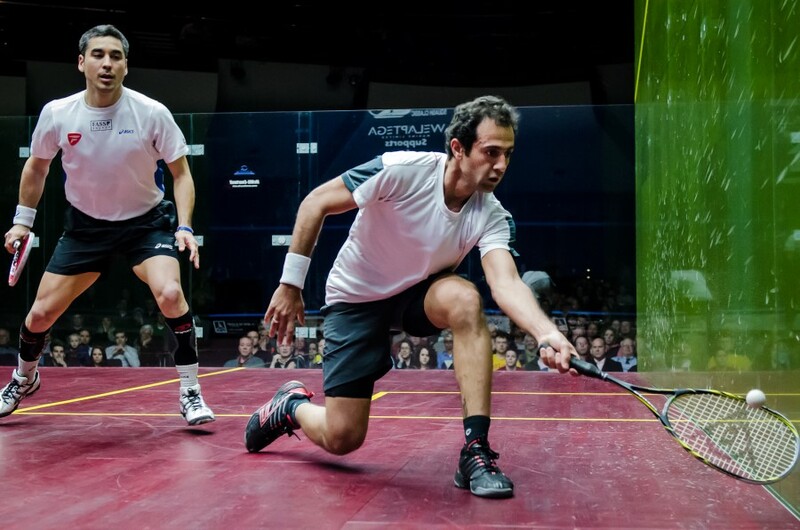 If done it is almost only done so well from the very front of the court as counter attacks where deception doesn't matter and we are hitting the ball so softly it won't rise much (or at all) after contacting the front wall. Shabana swinging with an open racquet from low to high on a forehand counter drop. 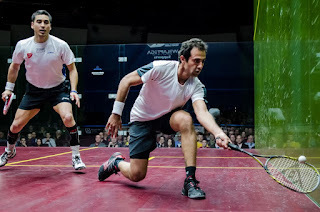 Shabana playing an overspin forehand counter drop off of a low and tight receiving ball. 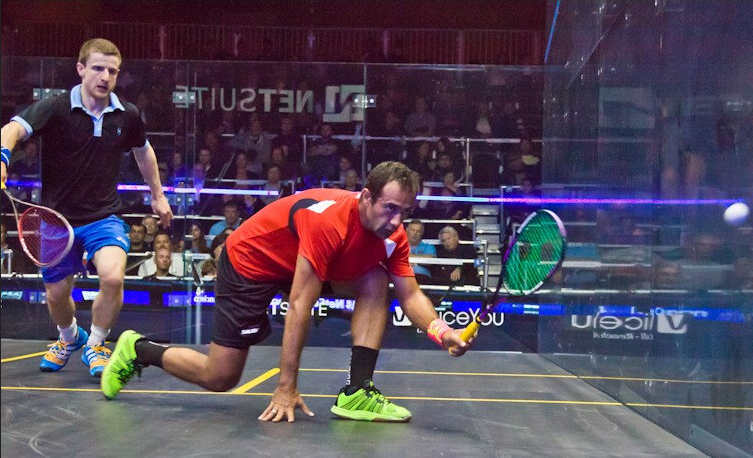 In the above picture you will see that Shabana has received a tight ball and it was pretty low to the floor. To get under the ball and keep it tight, Shabana used a slight overspin/topspin shot. You'll see the pros do this most of the time when the ball is really tight and once in a while from mid-court if they are really feeling it! It's a much easier to play on the forehand side. I felt like it was fitting to pay some homage to the recently retired Maestro, Amr Shabana. I normally wouldn't use a lefty for examples, but he is one of the very few lefties that I've ever seen with an exceptionally smooth swing. If you want to have a smooth swing path and drop it like the Maestro, try visualizing a clock, low coffee table, or some other piece of furniture you have in your house. It goes back to what an earlier post I wrote about the follow through. The ball 'usually' goes where our swing is aiming. If you want to ensure you hit your target, make sure that just prior and just after contact your swing is going towards your target and you will increase your accuracy. You can visualize different objects to help you with all types of shots. For some people the clock works, others like to use items. You could for example hit a lob from below your hip to above your head. Or to a kid you could say you want them to swing up along a slide. There are lots of ways that people learn. Find one that works for you. 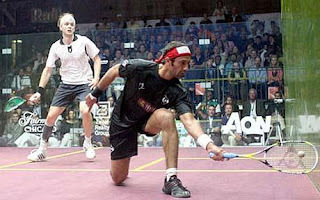 If you're good at billiards or geometry you will probably enjoy squash. If you've played any net game you should also have a decent understanding about angles and when the best opportunities are to attack vs. defend based on the reception height of your shot.